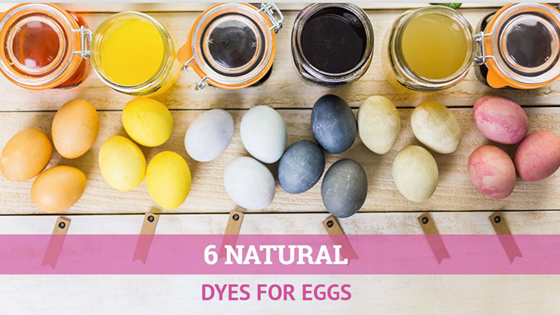 With Easter approaching, we thought it’d be fun to explore natural alternatives to egg dye. 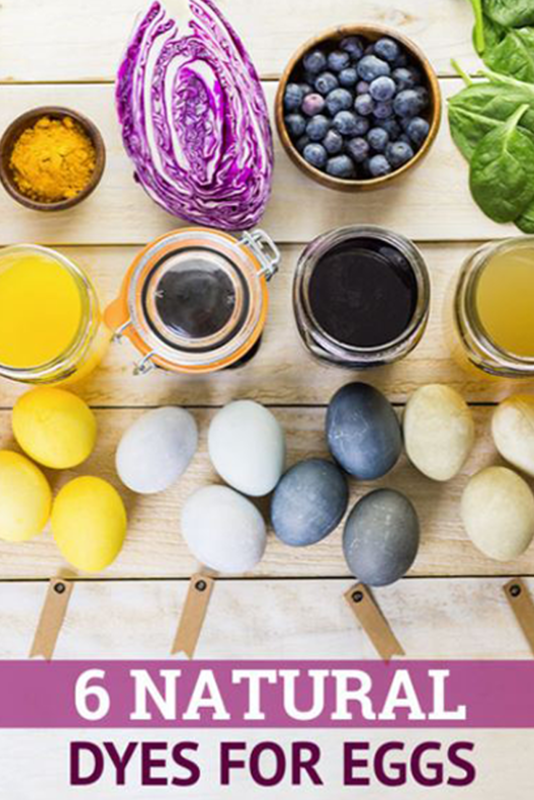 In this post, you’ll find six beautiful dyes for naturally coloring Easter eggs. These dyes are vegetable-based solutions, simple to create, and 100% chemical-free! Keep reading for a list of items you’ll need and instructions on how to make each color. Below you’ll find a list of ingredients along with the instructions to make each dye. Use white eggs to create orange, yellow, light blue, dark blue, pale green, and red colored Easter eggs. Note that you will need to boil a separate pot of water for each dye. See each color below for proper measurements and allotted dyeing time. Step 1: You will need to select a dyeing agent and place it in a pot on the stove. Step 2: Add 1 quart of water and 2 tablespoons of white vinegar to the pot. Bring the ingredients to a boil, then lower heat. Allow the ingredients to simmer for 30 minutes. Step 3: After color simmers, remove from heat and use a mesh strainer to strain dye into a bowl or container. Discard the solids. Step 4: Add an extra tablespoon of white vinegar to the finished solution and let the liquid reach room temperature before dying eggs. Orange: Use 4 cups onion skins (approximately 12 onions) as the dying agent for your solution. Follow steps 1-4, then soak eggs in solution for 30-45 minutes. Yellow: Use 3 tablespoons turmeric as the dying agent for your solution. Follow steps 1-4, then soak eggs in solution for 30 minutes. Light Blue: Use 4 cups of chopped purple cabbage as the dying agent for your solution. Follow steps 1-4, then soak eggs in solution for 45 minutes. Dark Blue: Use 1 cup of blueberries as the dying agent for your solution. Follow steps 1-4, then soak eggs in solution for 45 minutes. Pale Green: Use 1 pound of fresh baby spinach leaves as the dying agent for your solution. Follow steps 1-4, then soak eggs for 60 minutes in room-temperature solution. Pinkish Red: Use 5 cups of chopped beets as the dying agent for your solution. Follow steps 1-4, then soak eggs for 45 minutes in room-temperature solution. 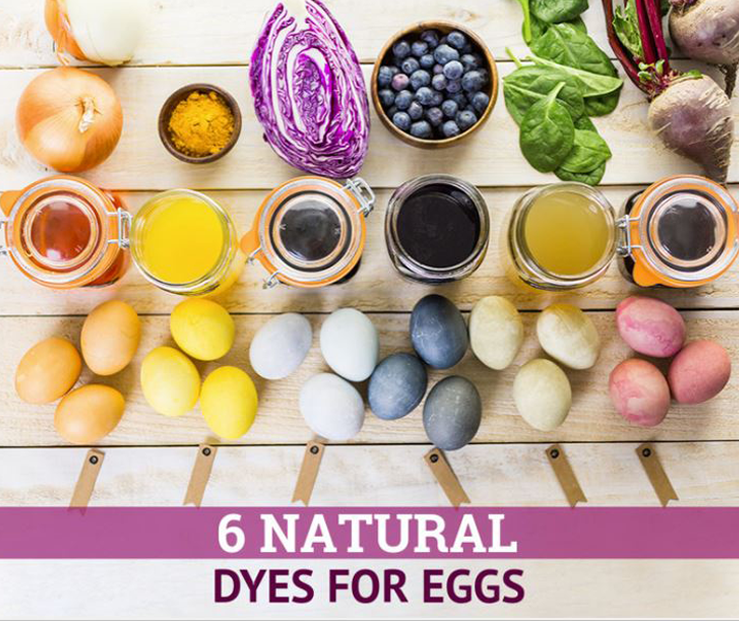 So there you have it friends, six all-organic and 100% natural dyes for eggs. We at Hirschfeld Apartments in Maryland would like to wish everyone a very happy Easter. If you liked this post, check out our article on creating chemical-free cleaning solutions, perfect for spring cleaning!